Visit the Museum for a Trip back in Time! Located on Main Street at 4813 – 47 Street, Sedgewick. Sedgewick’s past is brought to life through displays of clothing, jewelry, books, tools and photos. More information regarding the Sedgewick Archives & Museum can be found by visiting the Alberta Registry of Historic Places website. Monthly meetings of the Sedgewick Historical Society are the third Tuesday of the month at the Museum ~ 7:30 pm. The Sedgewick Archives is located in the Historic Bank of Montreal Building. 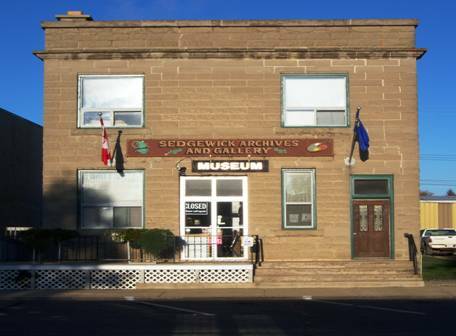 Sedgewick Archives Gallery and Museum was created on November 8, 1989. Donations are gratefully accepted and a tax receipt will be issued. Goose Creek School is a turn-of-the-century rural school (used from 1912-1957) that was moved into Town and set up as a “hands on” part of the Sedgewick Museum. The school contains the original Waterman-Waterbury heater and blackboard, large artifacts, and exhibits. The one room schoolhouse is one of the historical icons that once dotted the Alberta landscape. Built in 1912, Goose Creek School was located south-east of the Town of Sedgewick on SE-24-42-12-W4. The school was built on land donated by Wallace O’Brien, one of the pioneers who arrived in the area in 1906. As was typical of the times, the Goose Creek School was not only used for teaching the three R’s, but was a centre of activity for the surrounding district. It was also used as a place of worship by the Anglican and Presbyterian congregations of the time, as well as headquarters for the Agricultural Society, which was organized in 1919. The decision to move the schoolhouse into the Town of Sedgewick was formulated by the Goose Creek Community Association, who donated the building to the Sedgewick Historical Society on August 1, 2000. After years of fundraising and government paper-work, the building was moved onto its new foundation at 4901 – 48 Avenue on Tuesday, July 26, 2005. The official opening of the renovated school was held during Sedgewick’s Centennial Celebrations on June 30, 2007 by Alberta Lt. Governor Norman Kwong. 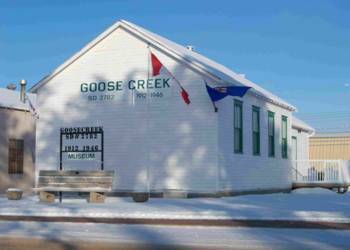 A visit to the Goose Creek School is a visit to Alberta’s past. From the “cloak-room” full of antiques from the period, to the school-room desks, maps, and chalk- covered blackboard, it is a trip back in time to the days when the one room schoolhouse was the hub of the community.